Corporate Consulting by Gladstone Consulting, Inc.
Gladstone Consulting prides itself on its reputation of providing and implementing creative solutions to complex business problems. We have an established reputation as a liquidator, but our consultants have also been involved in acquisitions, divestitures, debt refinancings and fraud investigations. With our team's breadth of experience and access to highly specialized professionals, we are willing to undertake any project and put our track record to the test. We understand that it is very difficult for some businesses to solve internal problems and to reach the decision to bring in outside assistance. We also know that as an objective third party, we are able to identify and quantify a problem and take decisive action before it becomes a true crisis. The most effective thing you can do to solve your problem is bring Gladstone Consulting on board as early as possible. Our experience has shown that problems often accelerate with management inaction or personal agendas. 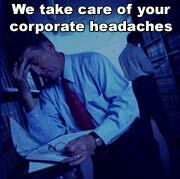 Contact us for an evaluation of your problem.